It’s magic and she likes it. It’s a curse on her existence and she wants it to go away. 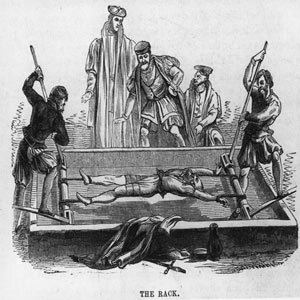 LBL’s enthusiasm for changing anything she has is comparable to that of a prisoner during the Spanish Inquisition being told that a revolutionary new torture rack has been invented that will speed up the torture process and do less harm to the rotator cuff of the torturer. NH then fails to notice that LBL refuses to say anything or to make eye contact with him. Based on this, he begins to email LBL mind-numbing data on all the various models of cell phones that Verizon sells. LBL refuses to open any of the attachments. Her reaction gets so bad, in fact, that she begins to fantasize about spending her time living in a cave and weaving. “Do you want a qwerty keyboard?” Finally this gets a response from LBL. “I will not discuss words that begin with the letter ‘q’ or anything that beings with a number.” LBL is also prepared to eliminate the entire alphabet, if necessary. LBL slinks into bed, pull the covers over her head, and eventually the Messages From Technology Central get fewer and farther between, then cease entirely. She falls asleep and has nightmares about Technical Support. The trackball was merely one of a number of features LBL told NH she didn’t want. Others included a screen and a keyboard. Apparently she was successful in squashing his dreams of cell phone upgrade. As soon as LBL realized that, she felt really bad. So bad, in fact, that she quickly reversed her position and declared that they should accept the new phones. It’s that push-pull thing with her that started in junior high. Boy likes her so she doesn’t like him. Boy ignores her so she develops a mad crush on him. Now she has The Boy, so she’s doing it with cell phones. NH has just entered the room. He says, “I’m thinking the new phone is perfect for you, but it really isn’t good for me. I’ll just keep my old one. But you will love your new phone.” LBL suddenly become one of the cast members of “Lost,” still on the island, watching the others leave. But unlike them, she can’t go back to 1970. ← Here's why Seabass WILL take music lessons. Amen! I leave all that cell phone stuff to my wife. Those contracts are to complicated for my small mind! Oy, and now I have another two years on the plan. That’s how I get the phone gratis. You and I are a lot alike, Renée…I “upgraded” my old cellphone at Jim’s urging. The kids would break into hysterical laughter every time I pulled out my old “peanut” phone, so I gave in…I still don’t really know how to use it, and the kids keep insisting on sending me text messages, despite my telling them to “Just CALL me!” AARGH! NHD asked he the other day if I had gotten his text message. I was thinking that I see this man close to 24/7. Why is he texting me? But when I found the text, it said, “I love you.” He knows how to diffuse me. This is hilarious and rings so, so true. I swear I didn’t intend that pun. Can I come with you to weave in the cave? That sounds like fun. It once took me twenty minutes to text, “Hello” to my son. I’m getting better, but not much. QWERTY hasn’t helped. Ironic, isn’t it. And you will appreciate this: Part of the lure of getting the phone is the built in sim card (I have no idea what a sim is) so I can bring the phone on my trips to London. Then I found out that each call would cost the same as my airfare. So I won’t even use it there. I sometimes wonder what I did without my cell phone–then I remember sometimes I was off on my own and nobody could bother–I mean call–me. I liked that. Agreed. I talk about that with friends. But sometimes we can’t even remember what it was like not to have a cell phone. I think guys just like to be helpful–even when we really don’t need helping! I’m with you on the technology stuff. I hoarded an old IBM selectric typewriter until a few years ago when my kids claimed it needed to be donated to the Smithsonian. Thanks for reading. Yes, typewriters. I love typewriters. I can speak to them and they understand me. My office has one typewriter left that will stay there until it finally bites the dust. One other realtor and I use it. When this one goes, I will mourn. I have to admit, I resisted an iPhone for ages and finally surrendered. Now I don’t know how I lived without it. Oy. Thanks for reading, JJ. I’m with you. Most of the time, I’m dragged kicking and screaming into some new technology, then end up loving it. many years ago, I wrote about half of a novel on a typewriter, while the brand new word processor sat about a foot away. My ex finally convinced me to switch. I love technology… like Joanna I have an iPhone and am read to pimp myself out for an iPad! I’m ready to pimp myself out.. though I could do ‘read’ as well? I liked reading your posts !! Thanks for reading! I am actually enjoying the new phone, so I am very relieved. And NHD is my in-house Technical Support Person. Even better!